The new Michigan Center for Global Surgery provides a unique, multi-faceted opportunity for Michigan surgeons to affect care on a global scale. 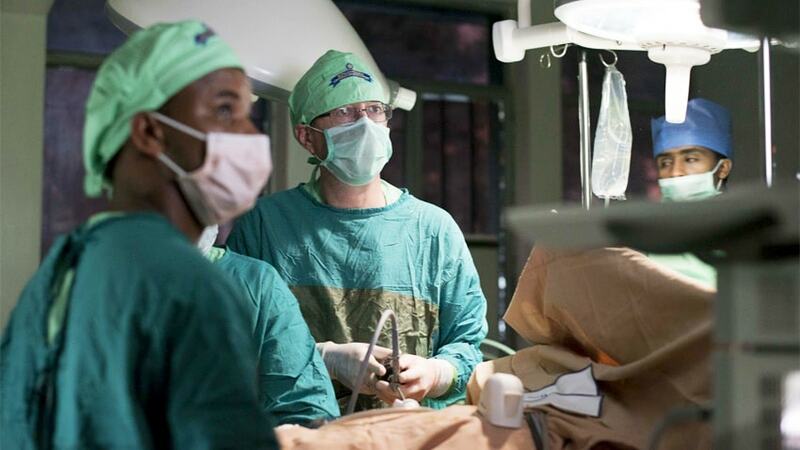 When Dr. Jeffrey Punch attended a celebration in Ethiopia this past September in recognition of his 50th kidney transplant in that country, he was reunited with the first patient to receive a transplant when the program began in 2015. The patient attended with his wife, who was then pregnant. Dr. Punch, a Professor of Surgery at the University of Michigan, explained that when a patient experiences chronic renal failure, they become infertile since the sperm are not motile. Now, as a successful recipient of a new kidney, this patient was able to father a child. "He was clearly delighted," Dr. Punch said. He added, "Kidney transplants affect far more than one person. You're transplanting a family." "Kidney transplants affect far more than one person. You're transplanting a family." Dr. Punch and his team have performed 56 kidney transplants in Ethiopia to date - a procedure that had been unavailable previously. Tens of thousands of Ethiopians die of kidney failure each year, while 95 percent of the kidney transplant recipients survive. Transplantation is a surprisingly cost-effective way to save lives, comparing favorably to removing many cancers or treating heart blockages, he noted. The collaboration between Dr. Punch and St. Paul’s Hospital Millennium Medical College in Addis Ababa, Ethiopia is an example of the type of work encompassed in the new Michigan Center for Global Surgery. The Center provides a unique, multi-faceted opportunity for Michigan surgeons to affect care on a global scale. At its October 6th launch event, Dr. Punch discussed how to train surgical specialists in countries lacking these surgeons. The event highlighted the global health movement occurring within the Department of Surgery. Surgeons from Michigan Medicine and other academic institutions spoke about the business of health care delivery, initiatives in India and Ghana and a new global surgery course being offered next year at the University of Michigan Medical School. 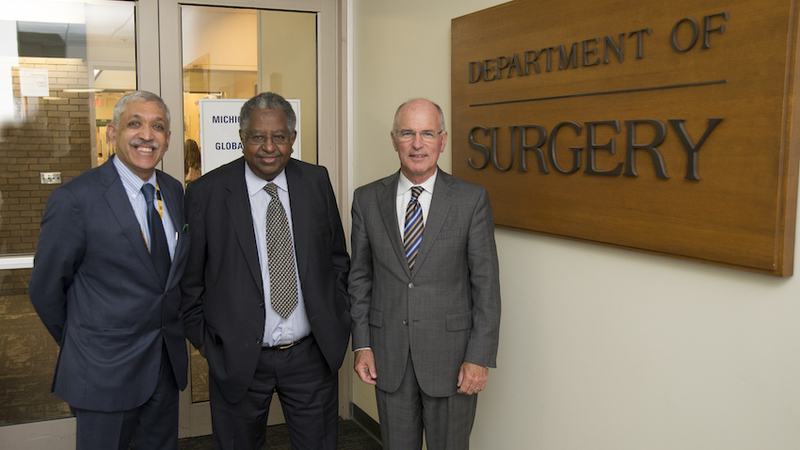 Dr. Raghavendran, Dr. Debas, and Dr. Mulholland at the launch of the Michigan Center for Global Surgery. Global health efforts until recently concentrated more on vaccination and infectious diseases, while surgical diseases had been neglected, said Dr. Krishnan Raghavendran, a Michigan Professor of Surgery and the Center's Director. "We treat surgical disciplines as an equal arm of global health. Appropriate surgical intervention for a few diseases has the potential to significantly improve the current situation where about five billion people in the world are denied access to surgical care," he said. Although some academic surgery departments are involved in global surgery, he explained that "few are doing it at the scale we are." The main goal of the center is to further research, in addition to improving access to clinical care and medical education. It also brings the many types of global activities within the Surgery Department under one umbrella. Currently, between 20 and 25 faculty are involved in global health projects in six countries and four continents. "Appropriate surgical intervention for a few diseases has the potential to significantly improve the current situation where about five billion people in the world are denied access to surgical care." The focus of the Center is not on mission trips where surgeons arrive intermittently, perform operations and leave. Instead, the interests are academic, focusing on building capacity and conducting research in the host country. Dr. Raghavendran said that in India, a research methods course educates junior faculty about methods involved in scientific research, "creating a channel for active communication and collaboration." Dr. Punch's efforts are a key illustration of capacity building. The mission model does not work for kidney transplants, since patients need follow-up care. The partnership with Ethiopia resulted in a comprehensive new facility for transplants that includes an exam room, a lab, a dialysis unit, a recipient ward and an outpatient clinic. He explains that many Ethiopian surgeons must receive the training they need in the United States, but they establish roots after years of training and are often reluctant to return to their home country. Dr. Punch has been training four surgeons in Ethiopia who will remain there to perform kidney transplants; that training is scheduled to be completed next year. "The beauty of this is that it's sustainable. They'll have four surgeons who will train more people and it will grow from there," he said. Dr. Raghavendran expects the Michigan Center for Global Surgery will prove to be an important recruiting tool for the younger generation. The Center will create a path for academic activities in the global arena for junior faculty and residents. When residents visit other countries, they see how health care is performed in an environment with limited resources. As the future of medicine in the U.S. is headed in this direction, learning how to do more with less is a key tool, he said. Dr. Punch added that there is value in learning about alternative approaches. In Ethiopia, he observed that oral narcotics are not used for post-op pain as they are in the United States; the patients fare remarkably well with more mild pain relievers like Tylenol. "We know that a sizable percentage of those [in the U.S.] who have an elective operation will become narcotic addicts," so evaluating practices in Ethiopia holds merit, he said. Dr. Punch collaborating with a team in Ethiopia. There are currently active collaborations with the Departments of Surgery at the All India Institute of Medical Sciences and the Chang Gung Memorial Hospital in Taiwan, and the goal is to further research with those two institutions. Dr. Raghavendran is also eyeing future collaborations with institutions in Hong Kong and South Africa. However, he is most interested in identifying a local and meaningful cause within the state of Michigan because global outreach must be rooted in local outreach. The Center will be home to a new global surgery course, due to begin in February 2018 as an elective offered in the Medical School curriculum. Dr. Kavitha Ranganathan, a resident who created the course, recalled that when she selected a surgery residency, it was difficult to determine how to pursue global surgery within an academic setting. As surgery has become a more important focus within global health, it was the "right time and right place" for this course, she said. The course will serve as a way for medical students to apply global health to a surgical career early in their education, so that they can achieve a broader outlook on how to integrate global surgery and academics. The course is structured with three main components. First, faculty actively engaged in global surgery will present their research to educate and inspire current students using ongoing projects. Second, students will learn about research methodology pertaining to specific ideas and principles unique to global surgery efforts. They will also gain experience in collecting data and conducting literature searches to better understand how to apply science to this field. Lastly, for the capstone part of the course, students will select a research mentor and engage in a research project resulting in publication. This research component, documenting outcomes and publishing papers, is what holds the most potential in benefitting both the university and institutions abroad, Dr. Ranganathan said. Instead of using trips abroad as the sole focus of the global surgery experience, her hope is that the course will allow students to understand what it means to participate in global surgery on an academic level, forming the basis for a successful, sustainable career in this area. "Global surgery is so new. To be one of the first to incorporate this into an academic career is really exciting," she said. Her views are shaped by two experiences in India this past December: exploring how breast reconstruction can impact breast cancer care and improving access to burn care. "The trip helped me establish relationships critical to doing research abroad," Dr. Ranganathan said. One of her biggest takeaways is that the study of global surgery is uniquely suited to fostering bidirectional learning experiences, which have the ability to improve the care delivered in both resource rich and poor areas. For example, she noted that identifying cost-effective ways to deliver surgical care in the United States can be learned from hospitals in low-income areas that achieve excellent surgical outcomes despite resource restrictions. Similarly, as an institution with relatively more resources available to conduct clinical care and research, "we have the ability to improve these specific aspects of surgical care abroad," she added. "Global surgery is so new. To be one of the first to incorporate this into an academic career is really exciting." Dr. Raghavendran hopes faculty will propose new initiatives for the Center, growing the number of projects and opening up opportunities to other faculty in the department. Global surgery, he said, speaks to the core of why people pursue medicine. Due to how linked the world is today, "that desire will continue to grow." He sees global surgery for residents and medical students as "the next frontier that we can use to advance our field."  Explore the work being done by the Michigan Center for Global Surgery. Discover more details about Dr. Punch's collaboration with St. Paul’s Hospital Millennium Medical College in Addis Ababa, Ethiopia.